The Welcome Table: Now in our 4th year! You may have driven by The Welcome Table sign out on Todds Lane. Tuesday nights, at 6 PM sharp, the doors of our social hall open with the aroma of freshly prepared food. Guests are welcomed, seated at dressed out tables and then served by volunteer wait staff. 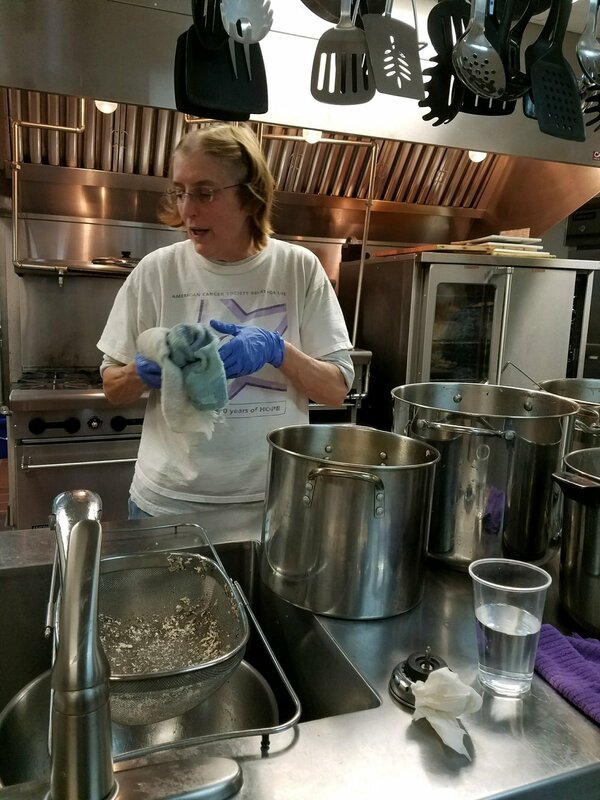 Four rotating cook teams make every effort to offer tasty and balanced meals for an average of 135-155 guests, as we address both hunger/food insecurity and create a hospitable place of community where all are welcome. Purpose. Providing a free, nutritious meal once every week to our guests who are of every race, ethnicity, and economic status, singles and families, secure and homeless, seniors and children, working and those living paycheck to paycheck. This in a place where all are welcomed with respect and warmth. While not central to the Welcome Table's mission, upon leaving the table our guests can take advantage of both our clothing closet (established by the Girl Scouts for us!) and free groceries that include breads and other items we are grateful to receive from our Foodbank partners (Food Lion and Panera Bread). Goal. To become a place where “volunteers” and “guests” work and share side by side, meeting needs, increasing understanding, and strengthening the community in which we all live and work. Special Sharing. The guests and volunteers mingle to share concerns and joys. Guests are invited to bless the food and share joyous occasions such as birthdays and wedding anniversaries. Sometimes, guests even provide musical entertainment for the whole group. The pastor and others spend time with our guests, many of whom become familiar faces and whose stories we learn and concerns we share. At the end of the dinner hour, you’ll find guests helping volunteers put away the salt shakers, wipe down the tablecloths and straighten the hall. You may notice, some guests have become volunteers assisting in the serving of others. Volunteers. Every week some 20-30 volunteers, most drawn from members of our congregation, with others coming from the neighborhood and nearby churches. There is a lot of laughter and joy shared during the Monday mornings initial food preparation and then Tuesday afternoon preparation, the dinner, and clean-up. 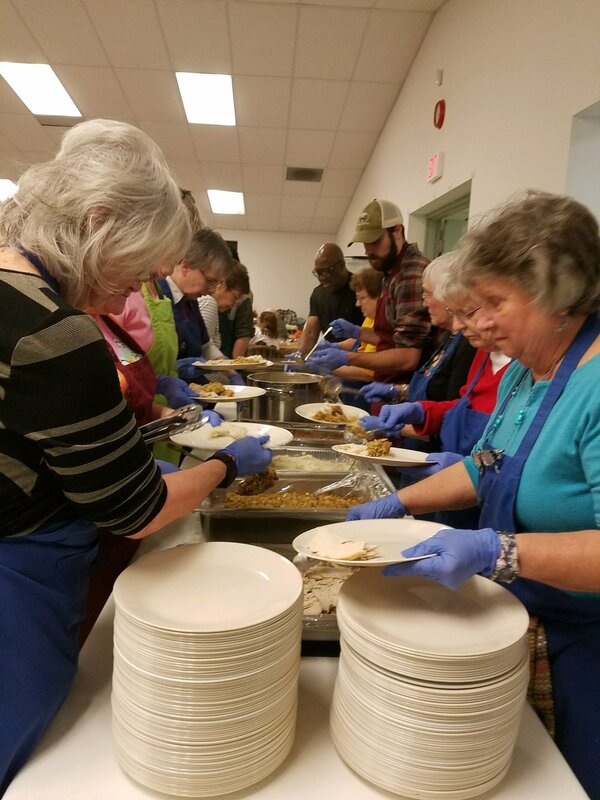 Once the meal actually begins a varying collection of volunteers from outside the church and younger members from within the church assume the actual serving of the guests. If you are interested in volunteering, please let us know! Material Support. A majority of the food is donated by local suppliers via partners of the Virginia Peninsula Foodbank (Food Lion and Panera Bread). Some of the cost is covered by donations to the church in an account designated for "The Welcome Table." We certainly will accept monetary donations, as well as the following items for meal preparation: canned vegetables (no green peas), canned baked beans, canned peaches or apples, diced tomatoes, canned sweet potatoes, instant mashed potatoes, light brown sugar, and creamed soups (chicken, mushroom, and celery). Invitation. You are invited to join us as guest or as a volunteer in this effort to make God’s love known in this community. We are blessed to be a partner agency with the Virginia Peninsula Foodbank, about which you can learn more about by clicking on the "button" below.